Visit the Event Page for photos and info. Join us in celebrating the Life and Music of the undisputed Queen Of Tejano; Selena Quintanilla-Perez. 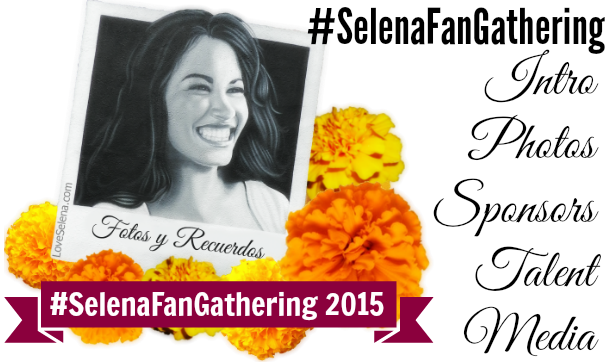 The #SelenaFanGathering is a fan tribute created by Roger Gomez in memory of Selena and for a chance to meet fellow Selena Fans. Bring a single white rose to be entered to win our awesome giveaways! of the Selena Mural in honor of her memory, smile and contagious laughter. Wear your favorite SELENA shirt! Bring your own Bedazzled Bustier! Food Truck, Kids Corner with coloring pages by CrystalGalindo.com and TodoMono.com, Giveaways and more! Raffle tickets will be distributed upon receiving your rose. We ask you to please RESPECT the grounds and property of Plaza De La Raza, our Performers and eachother. Plaza De La Raza, Maria Jimenez-Torres, Chris Perez, Carlito Miranda, Samuel Reyes, Andres Lucero, Celina Portillo, Frankie Gomez, Carlitos Gomez, Stephanie De La Rosa, Myriam Garcia, Nora Gonzalez, Mari Salas, Jessica Lucia Roiz, PulsoPop.com, VOXXI.com, Kris Brix, LAButtons.com, Louis Gonzalez, Bryan Avila, Tania Saenz, VolverVolverVintage.com, Johnny Insignares, TodoMono.com, The_Selinas on IG, Ruben Dario Villa, FuchilaFresheners.com, Yadi Hurtado, YadiPresents.com, Johnny Caballero-Salaiz, Monica Peralta, Levi Ponce, Hector Silva, Carolina Habibi, Natalia Loya, Sara Quintanar, Jose Daniel Martinez, Jean Miracle, Jorge Enrique, LaMuzikMachineII, Penney Leone, Kat Lopez, Eva Rocha, Fatima Paz and all my fellow Selena fans for the love and support especially for those who attended! Tell us how you spent the day, was it fun? Did you win something? Did you meet Chris? What was your favorite part of The #SelenaFanGathering! Helping to keep Selena's music, memory and legacy alive since 1995!